Racing at the first European World Cup began under the Norwegian sun as B-bracket riders fought it out for the last four spots in the main event. The clouds moved in as the A-bracket was ready to get underway, but luckily the track stayed cool and dry for the duration of the event. Early rounds passed smoothly with a few major upsets as 2007 World Cup Champion Erik Lundberg, 2012 World Cup Champion Douglas Silva, and Brazilian dark horse Thiago Mohr failing to advance. The quarter finals were heavy as ever with almost all contenders represented. 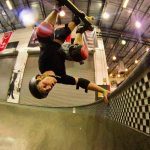 The ongoing Colorado/Brazil rivalry raged on as defending champion Thiago Lessa together with fellow Brazilians Carlos Paixão and Max Ballesteros faced off against Aaron Hampshire, Zak Maytum, Justin Rouleau, and Tanner Morelock for spots in the semis. Sweden made a good showing as usual sending 2013 World Cup Champion Adam Persson, Mauritz Armfelt, and young gun Anders Inde deep into the bracket. Former Lillehammer finalist and prolific footbrake icon Aleix Gallimo was the only serious contender from mainland Europe. Lone Canadian Alex Charleson, wild card Harry Clarke, and Junior Champion Ed Kiefer rounded out the top 16. 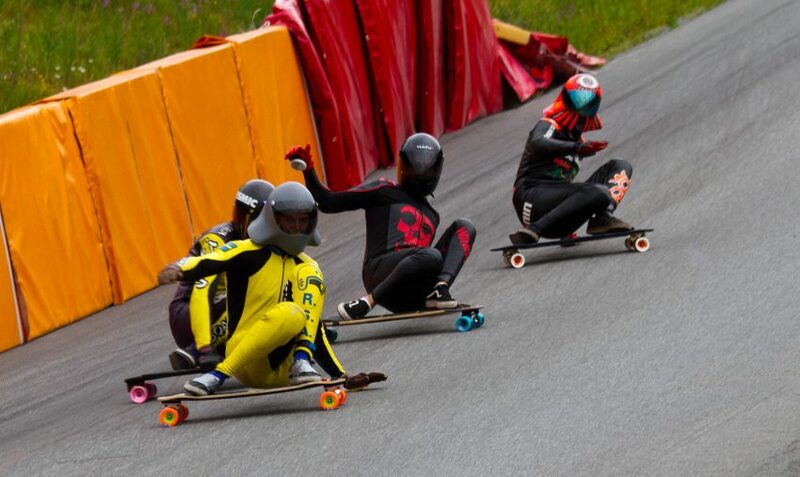 Despite a tractor trying to pull out onto the road, Adam Persson and Justin Rouleau triumphed over Harry Clarke and Aleix Gallimo to join Paixão and Charleson in semi-final A.
Zak Maytum and Mauritz made momentary contact while sliding into the fast left hairpin causing both to lose speed. Max Ballesteros capitalized and moved on easily to the semi finals. Mauritz rode it out spectacularly despite a modified foot position and managed to maintain 2nd place in the heat. Aaron Hampshire and Thiago Lessa completed semi-final B. In semi-final A Adam led Carlos into the fast left putting down an early, low degree slide. Carlos made a move to the inside to attempt an attack line on the fellow world champion. Paixão started his slide too late causing him to slide deeper into the corner than anticipated and putting him within millimetres of the tail of Persson's board as he pushed wide. Alex Charleson took a conservative approach and it paid off big time as he was able to sneak by on the inside unaffected and pass Carlos with a large speed advantage on the exit of the very flat turn landing him in his second world cup final in a row. Semi-final B was extremely tight entering the fast left. Leaders Aaron Hampshire and Thiago Lessa waited until the last possible moment to slide and were unable to maintain a tight line. Mauritz made the double pass quickly and Ballesteros followed closely behind with excellent exit speed allowing him to pass Mauritz for the lead before the finish. The Lilyhammer final was full of tangles, with Mauritz Armfelt getting the worst of it all. The Final was arguably the tightest heat of the day into the left hairpin that had been determining the outcome of most runs. The order into the turn was: Mauritz, Adam, Max, and Alex. Armfelt slid first with Persson just behind. In a mildly controversial move, Adam reached out and put a hand on Mauritz to keep enough distance between them to avoid wheel to wheel contact as he made a move to the inside while sliding. Armfelt then showed his tremendous skill again as the tail of his board was pushed out from under him by the nose of Ballesteros. He managed to stay on his board, but his cornering speed was severely compromised removing him from contention for the win. As in the semi-final, Junior World Cup Champion Alex Charleson played it safe and was able to hold a tight inside line that kept him out of the fray. He exited the turn close behind Adam and was visibly excited at the opportunity to challenge the former world champ for the win. Adam managed to hold him off for the remaining turns and earned another hard fought world cup win. Emily Pross underscored her dominance over the Women's field by maintaining her unbeaten run this year; seven wins from seven races. Is she the best women's racer of all time? Ed Keifer took a big step towards the overall Junior World Cup by defeating rival North Americans Jesse Martin and Knox Heslop, while in Masters Pete Connolly of the UK defeated Norwegian Cedric Cornell. In Luge Abdil Mahdzan increased his grip on the overall World Cup with another win, this time over Peter Eliot and George Cheeseman. Mr. Aero Helmet, owner of Venom, cowboy boot enthusiast, has no problems with being upside down.